If you are creating the first replica for this instance, ensure that the instance meets the requirements for master instances. Learn more. 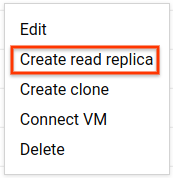 The steps for creating a read replica are different for Second Generation and First Generation instances. If the instance had backups and binary logging enabled, continue with step 6. Otherwise, enable backups and binary logging and click Continue. Click Save and restart to restart the instance. Enabling binary logging causes the instance to be restarted. In the Create read replica page, update the instance ID if needed, and any other configuration options as required. Cloud SQL creates a backup if needed and creates the replica. You are returned to the instance page for the master. If the databaseReplicationEnabled property is true, the instance is a replica; you cannot create a replica of a replica. You can specify a different tier size using the --tier parameter if needed. 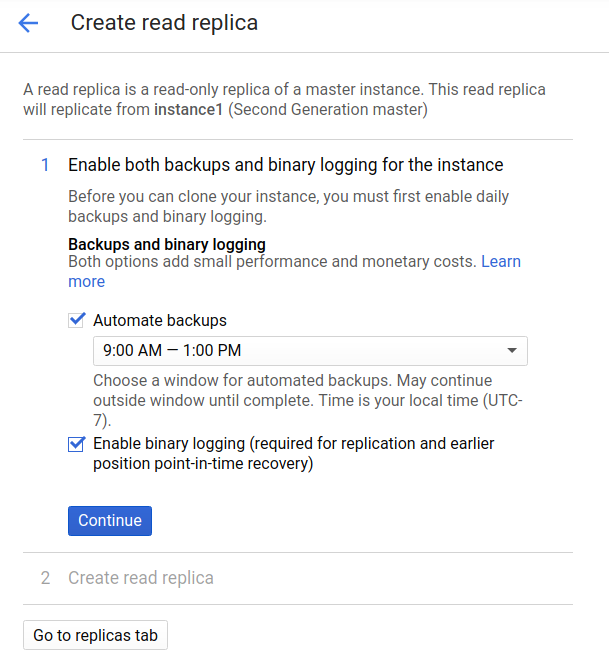 If the instance had backups and binary logging enabled, continue with step 7. Otherwise, enable backups and binary logging and click Continue. Click Save and restart to enable binary logging and restart the instance. If the instance did not have any backups, you must now wait for a backup to be created. It could take up to 24 hours for the backup to be created, depending on the backup window of the instance. In the Create read replica page, update the instance ID if needed, and any other settings as required. 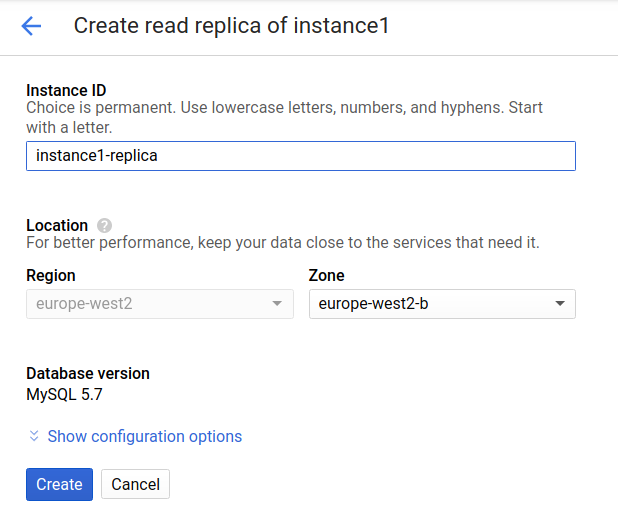 Cloud SQL creates the replica, and you are returned to the instance page for the master. If this command returns one or more backups, proceed to the next step. Otherwise, you must wait until a backup is created before proceeding. This could take as long as 24 hours, depending on the backup window of the instance. Check whether the instance has any backups. If no backups are shown, you must wait for a backup to be created before proceeding to the next step. This could take up to 24 hours, depending on your backup window. Use the insert method of the instances resource to create the read replica. The region must be the same region as the master.